Smoked salmon and courgette fritters, beetroot coulis and fresh coriander. Veal bolognese, basil and Parmesan. Grilled fillet of Hake, tamarind sauce, egg noodle and vegetable. Saute Pave of venison, stuffed apple with cranberries, braised red cabbage, celery and mushroom. Whilst we will do all we can to accommodate guests with food in-tolerances and allergies it is not always feasible for this particular menu. Egg mimosa, smoked salmon and chive. 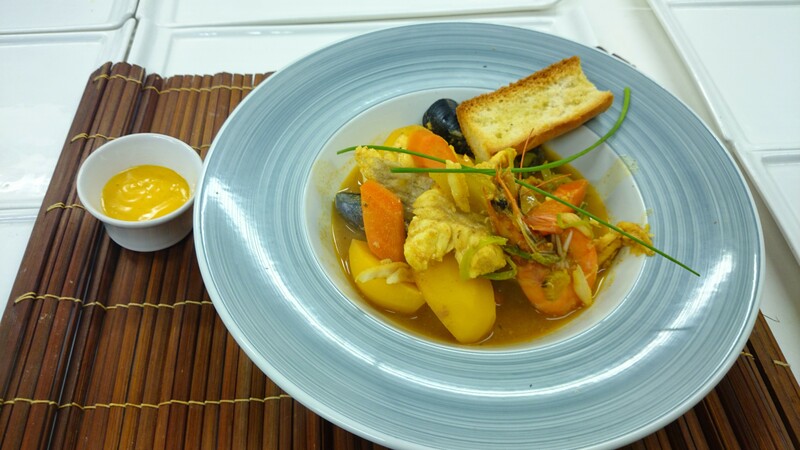 Fish stew with saffron, garlic and vegetable served with crouton and rouille. Braised duck leg, red wine, honey and sage on a bed of braised red cabbage.